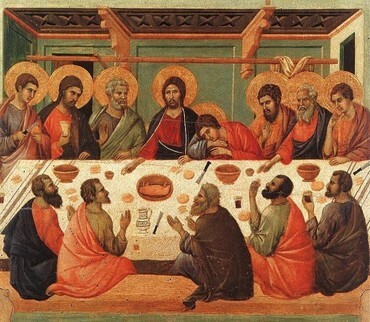 Maundy Thursday….as it gets closer, fewer and fewer words and less music. he is able to help those in time of trial. It’s Bank Holiday- not a day to have existential rumblings or crises. If you are English you should be out there in our lovely mid spring weather- hail, horizontal rain and howling gales. Except…if you read this blog with any frequency you will know that I stagger from question to question: it is the way I was made and it gives me both my biggest strengths and biggest weaknesses. ‘You know the deal… do your job, look after your family, pay off your mortgage and generally try to live as comfortable and safe a life as possible. Oh – and ‘give a little back’ if you can find the time’. These days I find myself attracted to what I do (full time ministry) and at the same time repelled by it- longing for a normal middle class life and at the same time fearing being sucked into the very same thing as the writer describes. It is so easy to be ‘christian’ where I live- get on, get wealthy and sprinkle a bit of faith on top and ‘do your bit’ when you can. I don’t normally blog about local church stuff here. That is mostly because I find it dull reading on other blogs. Also, if it is by a minister/pastor/priest I tend to think ‘This is your blog, your personal private blog, that you do in your own time and you are blogging about local church stuff? Get. A. Life. Develop an interest, a hinterland- anything’. There are notable exceptions that manage to do this really well- most of which link here (eg http://goodinparts.blogspot.com/Â to name but one). ‘â€¦ There are two types of DNA in churches. One type of church says â€˜we exist to have our personal spiritual needs metâ€™, the other â€˜we exist to impact our locality and the world with the gospel of the grace of God in Christâ€™. The first type is a stalled church’. I don’t like the typology of ‘two types’- there are more, but the guy has a point. IÂ am getting more hardline on the point that we don’t exist to bless ourselves, but others. Worship/church can never be our own private ghetto….but we so want it to be – faced with the possibility of moving to this, I find many responses like Winston in ‘1984’ ‘Don’t do it to me- do it to Julia’. I find it major, but also very scary. It is like I have been advocating for getting onto the diving board and someone suddenly saying ‘We are here- show us how to jump’. I’m more used to arguing that we should be there. And now we are there…. A short quote to liven up Tuesday. Tuesday is a ‘nothing’ day isn’t it? ‘Monday morning’: a grim euphemism for grimy reality, letdown and the worse aspects of back to work (except as a good minister I’m always working). For some strange reason I’ve always liked Wednesdays, but Tuesday doesn’t really seem to have a point. So here is a quote. One of the commentors to ‘Naked Pastor’s’ (see sidebar)New Year post left this quote and I thought it was staggering. ‘Just maybe in our post-modern milieu it is the honest artistic voice/song that embodies the sacramental in a way empty traditions no longer can’. I really like that- and I think there is more than a grain of truth in that. Author GrahamPosted on February 16, 2010 Categories godstuff, music, quotationsLeave a comment on A short quote to liven up Tuesday. I was talking with a colleague last week. They mentioned that they had done some research as to why people gathered for worship/were part of a Methodist church. The chief reason? ‘Fellowship’. On this research, there was little expectation that people might ‘meet God’. It could be that part of the response was to do with being British: we don’t like to talk about deep things or anything that might be construed as ‘personal’ (a gross generalisation, and dependent on age, class etc). I’m not sure though- I think the research is right. We speculated on using that desire for connection with people to move towards worship/expectation etc- lets face it- the architecture of most British churches is not set up for relationship or interaction (all in pews facing the front). Maybe that could help- I’m tired of Christian professionals bitching about congregations- take a ‘felt need’ seriously and use that to help people to see God in that. I’m realistic- I have an awareness of why people are (or are not) in church on a Sunday who claim the label ‘Christian’. I have no grand schemes to ‘resolve’ this- I am not sure that there are any (and I would distrust anyone who claimed that there was! )……apart from….. I did some posts last week about worship songs and why I increasingly struggle to sing them. I am not fully sure of my postings on that subject: that’s why I blog- to get stuff out, think about it and (occasionally) get others to comment. Jim over at http://brain-waves.blogspot.com/Â kept bugging me with a thoughtline (and if that is not a word, it should be) about ‘annointing’- which for those of you from a non charismatic bent means something like the sense that God is actively present, real, right now. It got me thinking about expectation. I used to equate expectation of God being present just with worship: ‘God we expect you to be here tonight’. Now I think that that restricts the idea of God just to worship meetings and the whole split between ‘sacred’ and ‘secular’ that I now have little time for. So what I intend to do over the next few days is just to blog a few brief thoughts/stories about expectation. Something I heard a few years back that really fired me- still does come to that. An apocryphal preacher’s story. A young preacher comes to talk to a wise old preacher (‘wise’ and ‘old’ are not neccesarily co-terminus) and spoke about how she was really frustrated with preaching: no one seemed to ‘get it’ and it felt like trying to get a Middlesbrough player to score (ie a lot of activity and fuss but rarely any success). And the older preacher said ‘ Then that is your problem’. Much as struggle with the concept of church, forms of worship, existential crises within and without, that sense has never left me and I hope never will.